Last week I shared my thoughts on a pipe band CD that inspired me, this week I want to share another that continues to inspire my passion for pipe band drumming. The Simon Fraser University (SFU) Pipe Band from Vancouver, Canada, have set many new benchmarks for pipe band performances in the last twenty years. Each CD they release highlights their musical innovation from a piping and drumming standpoint. As a young pipe band drummer, I recall listening to the Alive in America CD on repeat. 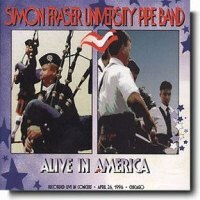 The Stars and Stripes CD cover gave me the impression that the SFU pipe band had a glitzy and glam appeal – and that they did! One of the great things about this CD is the raw sound, unaltered and un-edited. What you hear, is what was played. The music is simply outstanding with lots of drive and passion. Reid Maxwell got the most magnificent sound out of the Premier Percussion HTS Snare drums, they really complimented to the overall band sound. A snare response to die for. There are only a small handful of CD’s that I frequently enjoy listening to, as a form of inspiration. Alive in America has so many great highlights for me. 1) The Callum Hannah composition, the Big Wee Man Drum salute is fantastic – with lots of dynamic touches and phenomenal execution. The drum kit jazz groove is particularly groovy. 2) Andrew and Colin Lee – this hornpipe is sublime : a drummers dream. It’s a technically challenging tune but epic all the same. Considering the concert was recorded in Chicago, it was very fitting that the band played the “Windy City” to follow Andrew and Colin Lee. 3) Blackie MacLeod. This hornpipe has evolved into a signature SFU pipe band tune. SFU is renowned for finishing concerts with Blackie, and also walking off after the Worlds! Again, a technically challenging tune – but one of Reid Maxwell’s finest scores. If you haven’t got this CD, get onto iTunes and download it. It will be sure to put a smile on your face. It’s a pipe band classic – and one that everyone should enjoy. The modern-day crowds are pretty tame in comparison – the Gateway Theatre erupts in cheering and applause during many of the tracks. Thanks to the SFU Pipe Band for this great recording. Pipe Band Drumming Video Lessons – 50% OFF! Don’t miss out on the Christmas & New Year Special Deal on all Pipe Band Drumming Video Lessons. 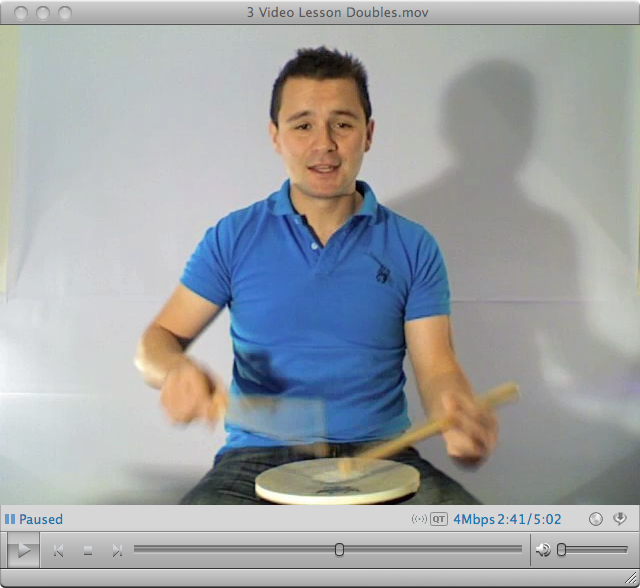 You can now get your hands on the Scottish Drumming Video Lessons with a whopping 50% discount! Get in quick and download your lessons today. The offer is only valid this Christmas and New Year. Each pipe band drumming lesson is only $1.99 for the next seven days. You can now learn how to play the pipe band snare drum, at home on your computer or on the run with your Iphone or mobile device. James Laughlin has created informative and professional pipe band drumming video lessons, for drummers of all levels. What benefits do you get from a Scottish drumming video lesson?